Birthplace : Lee's Summit. Missouri, U.S.
Patrick Bruce "Pat" Metheny is an American jazz guitarist and composer.Multi-Grammy-winning jazz fusion guitarist and band leader Pat Metheney, noted for expanding the jazz envelope over the course of the 1970s, '80s, and '90s, incorporates elements of pop music, traditional jazz, new technology, and rock into jazz fusion music, and delivers them in a textured, atmospheric style. He told Billboard's Bradley Bambarger about the Pat Metheney Group's 1999 release Imaginary Day, "Our past albums have always had a couple nine- or 10-minute songs that really try to take you somewhere, but with [Imaginary Day] we wanted to explore that territory from beginning to end. When I first took what became the title track to the band, I described it as a Chinese opera/blues with a Miles (Davis) "Filles De Kilimanjaro" interlude. Maybe that's indicative of where we're at." Other Pat Metheney Group members include co-composer and keyboardist Lyle Mays, bassist Steve Rodby, and drummer Paul Wertico. Bambarger went on to say that Imaginary Day's "intricate composition is wedded to spirited improvisation, yielding a far-reaching stylistic hybrid. It's music rooted in jazz but not limited to any preconceptions of how a jazz band should sound in league with the legacy of fusion pioneers Weather Report but more evolved and more even more electric." Metheney's music is based on the principle of playing bebop: employing chord changes and then improvising on the changes. Bambarger wrote, ""The Metheney Group has always been at the forefront of technology.... But one especially charged new track, "The Roots of Coincidence," even finds common ground with the likes of Nine Inch Nails." Metheney told Bambarger, "We question ourselves less and less about idiom as we go on." Metheney was born Patrick Bruce Metheney on August 12, 1954, in Lee's Summit, Missouri, where he was raised. He came from a musical family; his grandfather, father, mother, and older brother all played the trumpet, and marching band was their music of choice. Country and western music was pervasive in Lee's Summit as Metheney was growing up, yet he enjoyed a wide range of music, including the Beatles, the Beach Boys, and Miles Davis. At age 12 Metheney discovered the massive talent of Ornette Coleman when he found an album of his for 50 cents in a record store cut-out bin. He later told Down Beat magazine, "I thought it was the greatest thing I ever heard in my life." Metheney began listening to jazz music when he was a child and developed a great respect for the music's history. He told Down Beat, "If you're 15 and you want to be a jazz musician, you've still got to go back to 1900 and start checking it all out.... you have to have a thorough understanding of the tradition in order to consider going one step further." By the age of 15, Metheney was proficient at both the trumpet and the guitar, and by the time he was a senior in high school, he was balancing his time between jazz performances with small bands in nearby Kansas City and playing the French horn in half-time marching band shows for school credit. After high school he attended the University of Miami briefly before moving to Boston to take a teaching assistantship at the Berklee College of Music with jazz vibraphonist Gary Burton. In 1974 Burton invited Metheney to join his band; Metheney stayed in the band for three years, and recorded three albums. Then in 1977 Metheney began to organize and tour with his own band. A 1984 Down Beat review described Metheney's music as a balance of three parts, "the first being his own irrepressible Midwestern lyricism, the second a penchant for Brazilian rhythms, and the third the wild card of Ornette Coleman's jagged, insular logic." Metheney's work with keyboardist Lyle Mays and Brazilian percussionist Nana Vasconcelos on the albums As Falls Wichita, So Falls Wichita Falls and Offramp illustrated Metheney's lyricism and penchant for exotic rhythms. His flowing, melodic style was also emphasized in his straight-ahead jazz performances with Ornette Coleman on Song X, and with Coleman alumni Charlie Hayden and Dewey Redman on 80/81 and Rejoicing. The 1981 release As Falls Wichita, So Falls Wichita Falls established Metheney as a unique, vibrant new voice in jazz because of his focus on the texture of a song's improvisation rather than the more linear approach of improvising on a song's harmony. On the groundbreaking release, Mays, a multi-keyboardist and composer, moved from stunning solos to lush musical environments that enhanced Metheney's guitar work. Vasconcelos's drums and simple acoustic instruments offered an earthy rhythmic backdrop, providing a grounding effect for the electronic sound. During the early 1980s Metheney used a home computer as a composing tool and experimented with guitar synthesizers. The advent of the Synclavier an instrument with a built-in 32-track digital memory and the ability to create practically any sound for an instrument altered Metheney's way of working; he used it in the studio for nearly all his composing and in performance to create a wide range of sounds for his guitar. On many of his recordings, his guitar adopts tones which hearken back to the trumpet playing of his youth. Metheney achieved the sounds of various horns on his guitar which, in part, attributed to his reputation as an innovative composer, multi-faceted producer, and guitar synthesizer pioneer. In 1986 Metheney was presented with the opportunity to perform and tour with the idol of his youth, Ornette Coleman; they recorded the album Song X in 1986. Metheney's rounded tones and melodic sensibilities contrasted nicely with Coleman's hard-edged angular logic, and the result was successful. By the late 1980s, Metheney had toured as part of the backup band for singer/songwriter Joni Mitchell's Shadows and Light tour, scored the film soundtracks for The Falcon and the Snowman, Twice in a Lifetime, Orphans, Lemon Sky, Adieux, and Big Time, and had garnered four Grammy Awards from more than a dozen albums. In 1997 Metheney received a declaration from the governor of Missouri proclaiming February 25th as Charlie Hayden/Pat Metheney Day in honor of their release Beyond the Missouri Sky Short Stories by Charlie Hayden and Pat Metheney. Throughout the 1990s, Metheney continued his prodigious output and garnered Grammy Awards as a composer in 1990 and a solo artist in 1992; and with the Pat Metheny Group in 1993, 1995, and 1998. Metheney was inducted into the Hall of Fame in 1994, and scored the music for the lauded films Cinema Paradiso and Passagio Per Il Paradiso. Within the brackets of musical history, Metheney stands to be one of the great innovators in the pioneering jazz tradition. 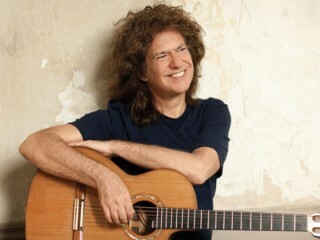 View the full website biography of Pat Metheny.